Right now we are waiting for new Martin LEMAN Art to arrive at the gallery. In the meantime, here is a selection of the artist's archived art work which has featured at Red Rag Art Gallery. If you wish to register to receive updates and alerts when new art work from Martin LEMAN arrives select this link. 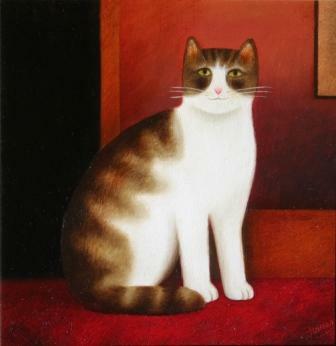 Martin Leman has been best known for his exquisite paintings of cats. He is one of the most popular contemporary British artists, he also has an avid following abroad, especially in America and Japan. Leman's illustrated books have sold well over half a million copies and his etching shown at the Royal Academy in 1998 was an instant sell out. Martin Leman was born in London in 1934. He studied at Worthing School of Art and later at London's Central School of Art. He initially worked as a designer, illustrator and typographer in advertising and publishing. In the early 60's Martin Leman became a full time professional artist making painting his main occupation. 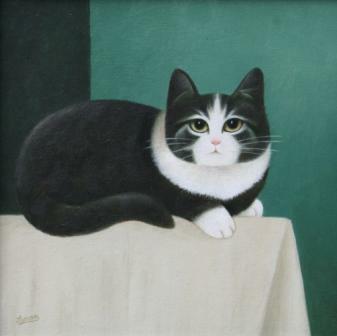 A turning point in Martin's career was a painting of a small tabby cat situated in a decorative interior. 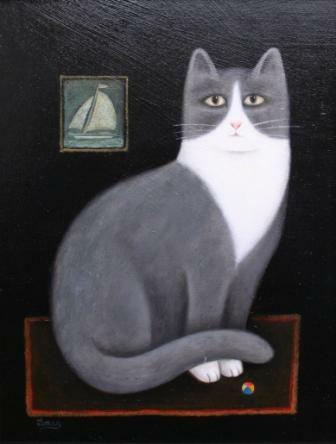 It sold immediately and so begun his long association with cats. Leman has been described as 'the most sophisticated of 'naïve'� British artists, but unlike many so-called naïve or primitive painters, he had a thorough artistic training. 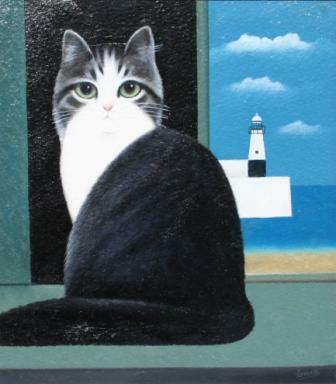 Although born and still living in London, Martin Leman has a special affinity with Cornwall and in particular St Ives, which forms the background to some of his most notable cat paintings. Leman's design for a signed limited edition campaign poster played a valuable part in fund raising for the Tate St Ives. 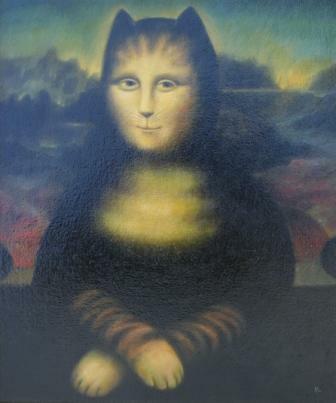 Martin Leman has exhibited internationally, and is a regular exhibitor at London's Royal Academy Summer Exhibition. His paintings are held in many private art collections throughout the world. In addition to Red Rag British Art Gallery Martin Leman art work has been exhibited at other leading British Art Galleries. Each painting at Red Rag is sourced from the Martin Leman artist studio and like all Red Rag British art and Contemporary art it can be shipped worldwide.